Screenplay: Nicolas Winding Refn, Roy Jacobsen. Starring: Mads Mikkelsen, Maarten Stevenson, Gary Lewis, Alexander Morton, Stewart Porter, Gary McCormack, Gordon Brown, Andrew Flanagan, Jamie Sives, Ewan Stewart. Director Nicolas Winding Refn has gained a bit of a cult following after his previous film “Bronson”, about Britain’s most notorious and violent prisoner. Now he gives another portrayal of a violent prisoner, in this art-house, ethnographic, dreamlike film. 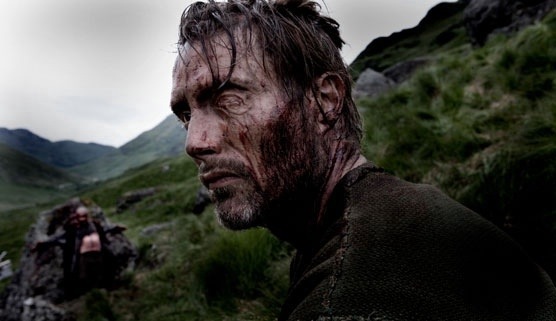 A thousand years ago, ‘One-Eye’ (Mads Mikkelsen), an enigmatic, mute warrior-slave, is freed from captivity and falls in with a party of Christian Vikings who set out for the Holy Land but cross the wrong sea, reaching a vast, overwhelming land with potentially hostile inhabitants. This is a film that’s guaranteed to split audiences as it’s definitely not for all tastes. 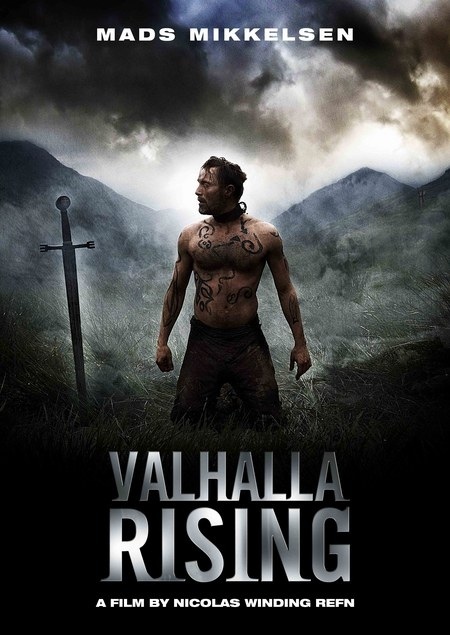 It’s a spiritual Viking film with a ghostly atmosphere permeating throughout and sudden bursts of graphic violence. It also has a highly effective meditative pace an ethereal feel but I struggled to find anything meaningful and seriously considered whether any of the actors knew what was going on either. They looked just as lost and bewildered as I did. Yes, it has shades of Werner Herzog and Terrence Malick but it’s not quite as accessible as those directors. Winding Refn certainly makes it look the part though. The cinematography is gorgeous with wonderfully captured Scottish landscapes and every frame is a work of art but it left me feeling like I do about ‘modern art’, which is… Blah – pompous and pretentious claptrap. What I found most intriguing was how the actors could walk around the Scottish highlands, battling the elements without as much as a decent raincoat on. That’s not an easy thing to do… I’m impressed. There’s no denying it’s hallucinatory beauty and must admit that it lingered long after it finished, but really, for me, it’s Valhalla Shmalhalla. This entry was posted on January 26, 2012 at 11:14 pm and is filed under Action, Drama, History with tags 2009. You can follow any responses to this entry through the RSS 2.0 feed. You can leave a response, or trackback from your own site. Arty farty nonsense man. At first I thought this was going to be something special but it ended up a pile of dross. I just didnt get it but maybe that was my fault. It would be interesting to see if again now that I’ve become a big fan of Refn after Drive.